Not too long ago, I was eating at a restaurant and ordered a Bourbon Glazed Pork Chop. It was quite a workout, to say the least. Tough and dry. I kind of think I might have looked/sounded a bit like this kitty, below. But I wasn’t saying Yum Yum – and I don’t know that this kitty is, either! The whole experience reminded me of how Brining can remedy the whole dry, tough pork chop thing! Even loin chops, or maybe especially loin chops, one of the leaner cuts, can benefit from a little loving care. I liked the whole Bourbon idea a lot, though. Enough to make a Sweet Maple Bourbon Barbecue Sauce to slather on these Pork Chops, and enough to make this Bourbon Maple Brine. The result was a succulent, juicy, flavorful chop and raves from the family. Honestly, we plan to make this meal again. And again. And again! If you’re looking for a bargain shop, avoid those sales that are for 10 chops for $10.00, and so on. These chops vary in size and quality, they’re hard to cook and have them done at the same time and they’re pricier than you might think. Those chops usually average about 4.5 ounces each and that comes out to about 2.81 pounds, or about $3.56 a pound. Buy a large loin on sale and cut and package your own. In a medium-sized bowl, heat 1/2 cup water in the microwave. Remove and add brown sugar and salt, stirring until dissolved. Add maple syrup, bourbon, peppercorns and thyme. Add the remaining cold water. In a Ziploc bag just large enough to hold the chops and liquid, add the pork chops, then cover with the liquid. Seal and refrigerate at least 15 minutes, preferably four hours or longer, up to 24. When ready to cook, preheat grill, grill pan, or skillet. If using skillet, use about a tablespoon oil, if using grilling method, brush grates with oil. 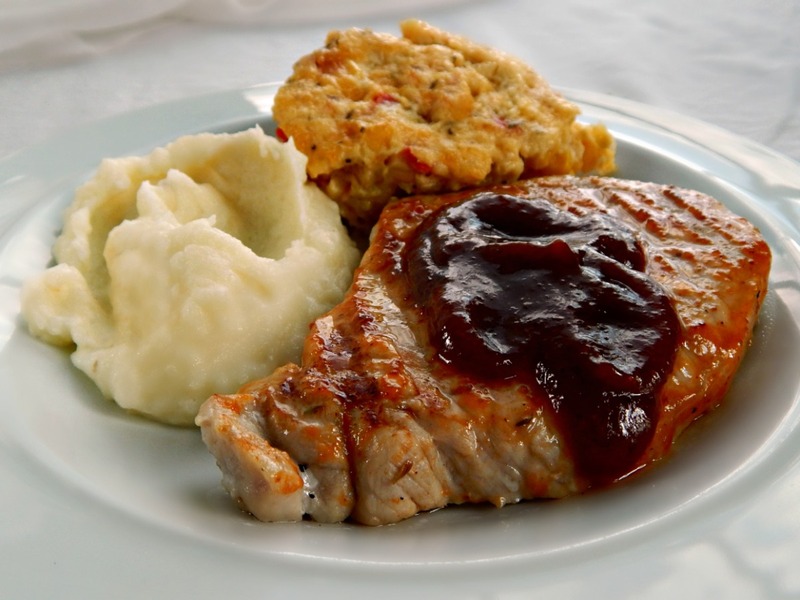 Pat pork chops dry and add to grill or pan. Using a brush, slather topside using the 1/3 cup barbecue sauce. Cook for three minutes and turn, brushing the top side again with sauce. Continue to cook 2 to 3 minutes more, to desired doneness, brushing with additional sauce as desired. Discard the remainder of this sauce. When finished, remove from heat, allow to rest for several minutes and serve with additional sauce. Read Strategies Applied for additional tips as well as throughout the recipe, for saving money/time and managing this recipe. You know I’ll be bringing this to our Throwback Thursday #37 Link Party, hosted by Quinn of Dad What’s for Dinner, Meaghan of 4 Sons are Us, Alli of Tornadough, Carlee from Cooking with Carlee and Moi! That’s right – me! I’ll also be bring this to Angie’s Fiesta Friday #118, hosted this week by Kaila @ GF Life 24/7 and Laurena @ Life Diet Health. This entry was posted in Click here for Bargain Meals, Click here for Fabulous Food Posts and tagged Alcohol, Barbecue, Barbecue Sauce, Bargain Meal of the Week, bourbon, Brine, Frugal Hausfrau, maple, Pork, Pork Loin. Bookmark the permalink. What a fabulous tasty looking recipe! yummm! I need to make this combo soon! Yummm! Thanks, Sophie! I don’t think I’ve dropped by to see what you’ve been up to on your blog for awhile!! You can never go wrong with bourbon & maple! They look good…and I want that lil’ kitty cat…so adorable! Anything ‘barbecue sauce’ will go down well in my house! The brining method is interesting and I might see what my Dad & my sister think (they both eat pork) – as it sounds like it works well 🙂 Thanks for sharing at Fiesta Friday – don’t forget to link up so everyone can see where you’re partying! 🙂 Quick question – what is the other thing on your plate (besides the potato) – that looks tasty too! Thank you, I DID forget to link up! And I hosted last week, so I know the rules! That is my corn pudding – post coming out soon! The taste is, but there is very little binder, so no fluffiness of a muffin. Your photo makes it look SO incredibly moist and juicy. This is definitely my kind of food. I am going to try your brining technique the next time I make pork chops. Because bourbon. That chop looks so good! I love how caramelized it looks, but still juicy! I haven’t grilled a pork chop in a while and now I really want chops! The brining does make a huge difference and always remembering that they cook just a bit more after they’re taken off the heat. I should have taken a pic of the inside showing how juicy it was but I was ready to eat, lol!! Thanks so much, I am sure that brining method totally helps! Yes, my pork in the crock pot only ends up being shredded into tacos or casseroles, I can’t slow-cook a chop into a real tender “chop-looking” pork chop to save my life, lol! Yum!! I love love love slow cooked meat like that!! You had me at bourbon 😉 Yup, my favorite liquor and definitely love it paired with pork! I love that this has a brine and a sauce – definitely a sure-fire way to get it good and juicy and full of flavor! lol, well you’ll have to read my Bourbon story on the BBQ sauce! 🙂 The chops were good, but that sauce on them! 🙂 Yum yum yum, lol! !